PLANTING: For spring, plant the seed 3-4 weeks before the last average frost. For fall, plant 6-8 weeks before the first frost average date. Broadcast seed or plant in rows ½-3/4” deep. HARVEST: 55-65 days throughout the growing season. Use cut and come again harvest on the foliage whenever it is large enough. Swiss chard does not store well. Eat fresh. Cool quickly after harvest if storage is necessary. 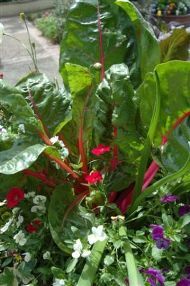 Chard can be harvested after the outer leaves are 4-5 inches long. For the best flavor, wait at least 60 days. HABIT: Swiss chard or chard is a relative of the beet and has similar habits and needs. Chard is a beet without a bottom. CULTURE: Chard likes cool temperatures but tolerates some hot weather. Culture is about the same as beets. NOTES: Chard can be eaten fresh in salads or cooked like other greens.